Looking for paleo dessert recipes? Sign up for my email list to get a free e-book of my top 12 grain-free dessert recipes! This easy-to-make paleo flour blend works beautifully as a cup-for-cup replacement for all-purpose flour in many dessert recipes! Are you as addicted to baking as I am? Are you also, like me, trying to eat healthier food without spending all day and night in the kitchen? This paleo flour blend is for you. When you bake grain-free, you can make delicious treats without all the guilt and gluten. When I stay gluten-free, I have more energy and fewer tummy problems. Even if you’re not technically gluten-intolerant, you may still feel better without it! I also guarantee your hips will thank you. To save time in the kitchen, this flour blend creates a one-stop-shop for gluten-free baking: you measure once and get the benefits of three grain-free flours in precise balance with each other. If you haven’t tried baking without grains yet, whip up a batch of this flour blend! Then start experimenting, and see who you can fool. I bet you’ll be hearing, “I can’t believe this is gluten-free!” in no time. I like to make my baked goods with a combination of almond flour, tapioca starch (also known as tapioca flour), and coconut flour. The almond flour lends flavor and richness, the tapioca starch adds lightness and helps with browning, and the coconut flour helps achieve a cake-like texture. I’ve been experimenting with the best ratio for these three flours, and have settled upon 3:2:1–three parts almond flour, 2 parts tapioca starch, and 1 part coconut flour. Once you have the right quantities, the next step is to sift the three flours together to make a blend, so that you only need to measure my flour once to make a recipe. You can of course make any amount of this flour blend by following the 3:2:1 ratio; the recipe below will make about four cups. You can start by using this flour blend in these molten chocolate cakes–just use 6 tablespoons of the blend instead of the smaller quantities of each type of flour. I also used this blend to make a delicious coffee cake this morning–stay tuned for that recipe later this week! I’m experimenting with substituting this flour blend cup-for-cup for all-purpose flour in regular recipes, and will update this post to reflect which recipes I’ve had success with. I can’t guarantee that this will be an effective flour substitute in every case, but it’s a great place to start. If this blend works for you with a particular recipe, leave a comment with a link below so others can try it, too! Update: I used this blend instead of all-purpose flour in this blondie recipe from Smitten Kitchen with great results! I also used coconut sugar instead of brown sugar, but other than that I followed the recipe exactly. Note: I haven’t tested substitutions for this recipe, but some readers have, so try searching the comments if you have a question! Measure two cups of almond flour, and sift it*. Add the tapioca starch and coconut flour, and fluff with a fork to combine. Sift the mixture two or three times to evenly distribute the flours. If you're not planning on baking with the flour blend within a few days, store it in an airtight container in the refrigerator. It should last for several months, but may not taste its best past the expiration date of your almond flour. *Finely-ground almond flour is best here. If there's just a teaspoon or so in the sieve after sifting, you can discard those coarse bits and proceed. If you're using a coarser flour, there may be more left in the sieve. In that case, you have two options. You can either grind that almond flour in a spice grinder until finely ground (don't go too far or it will turn into almond butter) and then sift it again, or measure the coarse almond flour left in the strainer, discard it, and add that much more (from your bag of almond flour) to the strainer. After doing one of those two things, you should only have about a teaspoon of coarse flour left in the strainer, which you can then just discard. Would this be ok in the freezer? Hi! Thank you for this recipe. I’m grain-free due to allergies/autoimmune condition, and while I’m okay going without baked goods during most of the year, it’s hard to go without during the holidays. I’ve used your blend in some cookies tonight with a few other modifications to the recipe, and they’ve turned out great. Hi Anna! I’m so happy this blend is working well for you! Any idea on the conversion ratio for this and just plain almond flour? I have a few recipes that I use almond flour in and would like to see if this would make them a little tastier! Thanks! It’s hard to say without seeing the recipes, but you could try using the same amount or a little less! Hey there I just used your recipe but I subbed Oat Flour for the almond flour because it’s a lot cheaper and oats are good for breastfeeding(my wife is). Just wanted to let you know because I see a lot of people asking about substitutes. Great to know that oat flour works here! Thank you! Hi. Do you have a substitute for the almond flour? I’m allergic to tree nuts so wouldn’t be able to use it. I haven’t tested any substitutes here. I recommend trying cassava flour, which often works on its own as a sub for wheat flour. Could you please offer an alternative for the Tapioca flour? I need to avoid that and I’d really like to to try your recipe. I haven’t tested it with other flours but you could try arrowroot instead (not sure if that will work for you since you didn’t mention why you’re avoiding tapioca). Can xanthan gum be used? Do you happen to know what the ratio of conversion between tapioca flour and xanthan gum? Looking back at the recipe now, it seem that adding a small amount of xanthan gum would that alter the volume of the finished recipe, thus it would no longer be a cup to cup situation? Would it then become a ratio of xanthan gum to volume of almond flour + coconut flour, and do you have any idea what that would be? I am not sure of the math at this point. I am not sure about the previous lady, but I would need to avoid tapioca because my endocrinologist has recommended I cut my carbs to 20 per day. I have been following the keto way of eating for about 8 weeks now to achieve this for now until I reach some goals. I have not had any baked goods since then and am just beginning to branch out and experiment. I would say I am an experienced baker, but these keto baking ways are new and strange to me! Thank you. Sorry for all the typos, my keyboard has been sticking and there has been a delay between what I type and when it appears on the screen! I thought I caught all of them! Hi Susan, I’ve never heard of subbing xanthan gum for tapioca and haven’t baked with xanthan gum myself. I doubt it would work, though, because xanthan gum is usually used in very small quantities. For keto, perhaps baked goods with just almond flour would be easier to work with in order to stay under your carb limit for the day. out easily, but be cautious about that, because too much xanthan gum can make things very gummy and unpleasant). In a yeast bread recipe, you can increase the xanthan gum to a teaspoon per cup. I have a vegan “egg replacer” by bob’s red mill. 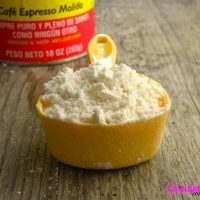 It is a blend of POTATO STARCH, TAPICOCA FLOUR, BAKING SODA, PSYLLIUM HUSK FIBER. Could I use this to substitute not have just tapioca flour? If so could I sub this mixture 1:1? Thank you! Maybe someone else has tried this and will chime in, but I’ve only tried this as written because it’s worked so well that way for me. Good luck! Thank you! I was curious about trying the egg-replacer podwer simly because we have it on hand and alternative flours tend to be a bit pricey, especially since we are shopping for a family of seven people and six animals! Haha. Again, thank you for the feedback! Haha, nice of you to share with your animals! Tapioca flour is one of the cheaper grain-free flours (much less expensive than nut flours) so it might be worth picking some up! Wow! Thanks for sharing your flour blend. I am on a low carb diet and this will be superhelpful. I am thrilled with this flour blend! I made banana bread today using my Gram’s recipe and it came out beautifully! I haven’t had my Gram’s banana bread in over 5 years! <3 I've also used this in pancakes and tortillas. Quick question, would this blend work for yeast breads? I would love to be able to make bread for my children. Hi Amanda! I’m so glad you like the flour blend and that the banana bread came out well! Now I’m craving a good slice of banana bread. I haven’t experimented with this blend in yeast breads (I actually don’t use this one at all anymore because I discovered I’m allergic to coconut), but it would be worth a try! In general it’s trickier to sub in a different flour when flour is a larger percentage of the total ingredients, which it definitely is for breads as compared to desserts, but I bet there’s a way to make it work. If you try it, I’d love to hear how it goes! I do have a recipe for yeasted paleo flatbread, which I LOVE and make often: http://acalculatedwhisk.com/paleo-flatbread/ and a recipe for burger buns using almost the same dough: http://acalculatedwhisk.com/stuffed-lamb-burgers-paleo-burger-buns/. Both of those are made with just almond and tapioca flour. 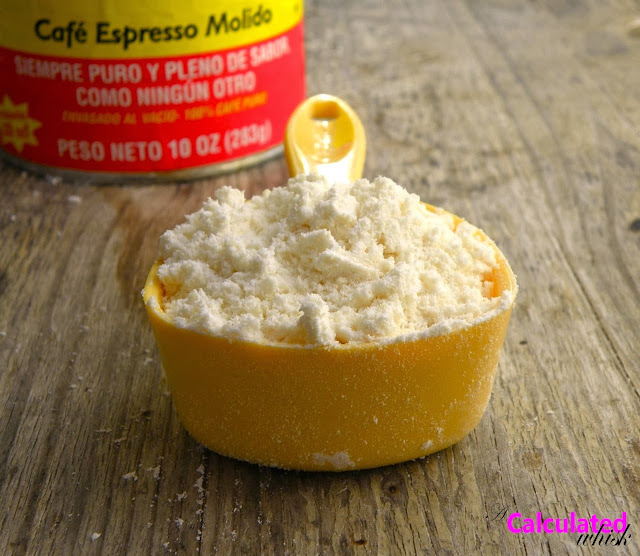 Have you ever tried to make homemade pasta dough with this? We’re low carb and gluten free and I’m really missing making homemade pastas. I’d love to make lasagna without using vegetables as noodles. Don’t get me wrong, zucchini noodles are good but I’m missing fresh pasta. Thank you for your blend. I’ve been trying to come up with one myself but you did the work for me. I haven’t tried pasta with this blend. I recently made this pasta with cassava flour: http://www.honeygheeandme.com/2015/09/homemade-pasta-with-cassava-flour-option-no-pasta-maker-needed/. I wasn’t totally pleased with the results, but I think I was too impatient to roll out the dough thin enough. It was still yummy, though! Cappello’s also makes a grain-free pasta that is very popular that I haven’t yet tried, but am hoping to as soon as local stores here start carrying it: https://cappellos.com/. If you try a pasta with this flour blend, let me know how it goes! Thank you. I might give it a shot just to see how it turns out. I do have a pasta roller so I should be able to get it thin. Can’t hurt to try anyway. I’ll let you know how it works out. Yes, let me know how it goes!! Lovely! This absolutely made my day! Such a simple blend, too. It will make life easier, that’s for sure. What are the nutritional facts per 1/4 cup serving??? According to Matercook, a 1/2 cup serving of this flour equals 410 Calories; 24g Fat (48.6% calories from fat); 12g Protein; 44g Carbohydrate; 11g Dietary Fiber; 0mg Cholesterol; 30mg Sodium. I was wondering what you can substitute for the tapioca. Also what’s your new blend without coconut flour. I go to potlucks a lot and have friends with soy, tapioca and coconut allergies. I noticed the ingredients on Bob’s Redmill Paleo flour is almost the same as yours but contains Arrowroot and Tapioca flours. Since Arrowroot was the 2nd ingredient I used 1 cup of it and since Tapioca was the 4th ingredient I used 1/3 cup. I was actually trying to come up with a copycat of Bob’ Brand and came across your recipe. I made pizza crust it turned out perfect! Tamitha, while I will try your measurement suggestion, as I use Bob’s Redmill Paleo Flour when I can find it, the ingredients in Bob’s paleo flour are listed in alphabetical order, so your theory may be flawed. I thought the same thing myself, but then realized the list was alphabetical. Suzanne, I believe it’s a coincidence that they’re alphabetical. The FDA requires that ingredients be listed in order of predominance by weight. Tamitha, so happy this worked out for you in pizza crust! Is there actually a really good gluten free pizza crust… I’ve tried them and I haven’t found one that even remotely tastes like bread. I’m getting inspired with these posts. If someone wouldn’t mind sharing there recipe I be grateful. Italian who can’t eat pasta… sad . Hi Vinny, yes, there is! I adapted my paleo flatbread recipe (http://acalculatedwhisk.com/paleo-flatbread/) into a pizza crust and shared it over on Gluten Free on a Shoestring (https://glutenfreeonashoestring.com/paleo-pizza). Many people have made it successfully!! Hope you give it a try. It’s not Paleo-I’m on the Keto Diet-but have you tried the Fathead pizza crust recipe yet? I have done gluten free for years and suffered with nasty cardboard crusts, but my whole family LOVES the fathead pizza! Search for it and try it out! Hi Niki! I have a paleo flatbread recipe (http://acalculatedwhisk.com/paleo-flatbread/) that makes a great pizza crust! I shared a pizza recipe based on it over on Gluten-free on a Shoestring: https://glutenfreeonashoestring.com/paleo-pizza/. Hope you give it a try! 🙂 It does use yeast, which gives it great authentic flavor. I’m very interested in trying this mix. Have you tried this specific blend for cakes ? If yes, how does it perform ? Hi Kate! I’ve used this in molten chocolate cake and coffee cake and it worked really well. Is there a specific recipe you’re trying to adapt? I think subbing this for all-purpose flour in a regular recipe would be a great starting point. I rely on this recipe for all of my baked goods. It always works. I just made peanut butter blossoms using the recipe from the Hershey’s website. I subbed this flour trio for the white. I didn’t change anything else and it worked perfectly. Can’t even tell they’re not made with regular white flour! That’s great, Janine! So happy to hear it. Thank you for coming back and leaving a comment! I have a great yeast paleo bread recipe that we love! The only thing is we are doing low carb and with arrowroot flour… well that shoots the carb count up a lot. WOndering what I would use instead. Recipe calls for 2 1/4 cup of almond flour and 2 1/4 cup arrowroot flour. WOuld this peloe flour mixture work with this? Maybe switch out some arrowroot flour for some coconut flour? I love this bread soooo much just need to bring down the carbs.. Thanks for your help. Hi Kay, I haven’t tried this with yeasted bread, but I think it’d be worth a shot! I don’t actually bake with this blend anymore since discovering my coconut allergy but perhaps someone else has tried it? If you do give it a go, come back and let us know how it went! My mum has had to recently go grain free. My sister os also vegan. I was hoping you could help me work out a good way to make this recipe grain free too. Would your flour work 1:1 in place od the oat flour and GF flour? It also already has almond flour too. I am at a loss as to what to use haha. Hmmm. I’ve never baked with flax eggs, so I might not be the best person to ask! I’d say as a starting point, though, you could use this blend in place of both the oat flour and GF flour blend. Then if the cake ends up too moist, you could also try using the blend in place of all the flour (almond flour included). Good luck! Thanks. Will replace the almond meal oats and gf flour with your blend will let you know how I go! Also, any suggestions also for swapping in something for a brown sugar? For the white sugar I am using coconut sugar, but I haven’t figured out what to do about the brown sugar? 2 cups and 1/4. Also is the Cassava flour paleo? Never heard of it. Lastly, if I don’t have Tapioca, can I use Arrowroot? I know you said they are similar, but I want to make this a great cookie so if this is not as good, I will run out and get the tapioca. I want my daughter to love paleo baking so I want this cooking to be great! 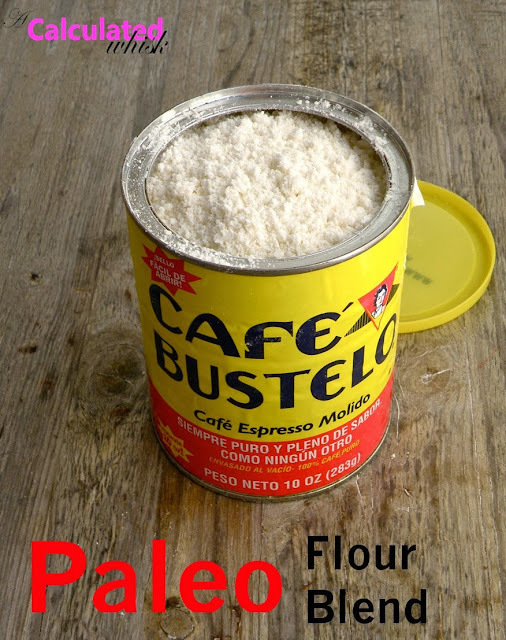 Cassava flour is paleo, and I love baking with it! I recommend Otto’s cassava flour: http://www.idevaffiliate.com/32360/idevaffiliate.php?id=182_0_1_2 (that’s my affiliate link). Many people say that tapioca and arrowroot are interchangeable, so it would probably work. To keep things simple I just always use tapioca, so I can’t personally attest to how well arrowroot would work. Let me know how it goes and what you end up trying–hope you and your daughter enjoy the cookies! Well it went ok. The taste is nice, but a bit salty, so I will reduce the salt. Also the cookies came out very thin, no fluff at all. So I added baking powder that helped a little but really no fluff. It was as though I didn’t put any flour in at all and cooked the wet ingredients. I ended up swapping out the 3/4 C brown sugar and used 1/4 molasses, 1/4 honey, 1/4 maple syrup, and 1/4 coconut sugar. Perhaps that is what made it seem runny. Since my daughter liked the taste, I wonder if I upped the 3-2-1 flour amount, if that would help make them light and fluffy. I want to keep the taste but make the cookie seem my bready if that makes sense. Yeah, I bet the liquid sweeteners made it too runny and not bready enough. I’d try all coconut sugar next time. Interesting that they were too salty! I wonder if a recipe that’s designed to be specifically paleo would go better. Yes, it was too salty but NOT bready at all. That was the main problem. I will try your paleo recipe next time. I think you could go ahead and sub coconut sugar for the total amount of sugar. It tastes more like brown sugar than white so you’ll get that caramel-y flavor that brown sugar lends. Thanks for the help! Next time I will try the pure coconut sugar and perhaps it wont be so runny. I will also try your cookies. The look good! I use coconut sugar to replace brown sugar. It is very similar! Yes. I used the recipe on the Nestle’s chips package and substituted this 3:2:1 mix 1 for 1 for the flour. It made the best cookies ever! Hello! I’m interested in trying this. Does this need to be used entirely in one recipe, or can I use some and save for another recipe? Also do you think this will be fine in the pantry, or should I put in the fridge? Thanks so much. I tried this flour with a chocolate banana bread recipe today and it worked very well. I did add some guar gum and had to turn the oven temperature down a bit to get it to cook through. Thanks for posting the flour blend recipe! I’m running low on gluten free flour but have lots of the flours listed so this will work well for me. Are you still experimenting with this ratio as a cup for cup equal? I am curious to know!! Kim, not so much anymore but it’s because I discovered I have a coconut allergy :(. I use mostly just almond and tapioca flour now (about a 3:1 or 4:1 ratio) or just 100% cassava flour. Would it be possible to replace the Almond flour with Cassava or Tigernut? Almond flour is not AIP friendly. Also have you seen Bobs Red Mill Paleo flour? Its almost identical, but they also use Arrowroot. Is there a benefit to adding this in? Thank you! Cassava and tiger nut flours probably wouldn’t be a good substitute for almond flour since they have such different consistencies. If you’re using cassava flour I wouldn’t bother with a blend–it works well all on its own in most recipes. When I bake with cassava I don’t add any other flours. Arrowroot and tapioca are very similar, so I’m not sure what benefit there would be to using both. I haven’t tried the Bob’s Red Mill mix, though, so I can’t compare it to my blend. This is my favorite Gluten free flour blend (paleo or otherwise)! It has worked well in every GF recipe that I’ve tried! Thank you for commenting, Elyse! I’m so thrilled that the flour blend is working well for you! I am sooo excited to try this! My kids have to eat gluten free, but I’m grain free and I’ve been desperate to find a way to only make one thing that everyone can eat! I’ll be trying it out today on some quick breads with flax eggs. Thanks! I love this recipe too. As a former baker, I had been unable to find a good Paleo mix for making my cakes and cookies and while there is still a bit of a grittier consistancy to the finished product it is the closest I’ve found. I even made biscuits for breakfast the other day and my husband really enjoyed them. Not as fluffy as regular biscuits but close enough. Thanks so much. This is my favorite GF flour blend! 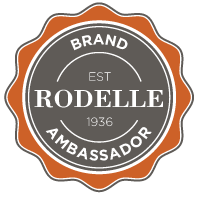 It has a great texture and I’ve used it in all sorts of recipes, with great results! That’s wonderful to hear, Elyse! I’m so glad you’re enjoying it. Can you please write out the measurements for each of the flours in words. I know it’s a strange request, but for some reason, the numbers have come through as symbols on my computer. It’s weird and I haven’t seen it before, but I would really like to have this recipe. It looks wonderful! Thank you so much! I’m so sorry it’s not displaying correctly! Here are the measurements: two cups almond flour, 1 and 1/3 cups tapioca flour, and 2/3 cup coconut flour. Any 3-2-1 ratio of almond to tapioca to coconut will also work! Hi Lisa! I can’t tell you for sure since I have not done much baking with egg substitutes. My guess is that if the rest of the recipe is adapted to be optimized without eggs (with more leavening agents, plus something like flax egg, chia seeds, or applesauce for moisture/binding), this blend would probably work well in place of regular all-purpose or GF all-purpose flour. Keep in mind that this blend doesn’t have baking powder or soda, and if you want to use it in place of self-rising flour you’d need to add those in. My last tip is that to begin experimenting, choose a recipe with a relatively small amount of flour and more of other things (for example, try brownies instead of sandwich bread, since they also have sugar, cocoa, etc.). If it goes well, keep trying with a wider variety of things. Hi Ashley! Sorry I somehow missed your comment. I’m so glad you liked the recipe–thanks for sharing it and linking back! I love your modifications for cake flour and self-rising flour, too. So cool! Can you please tell me if you add any xanthan/guar gum/pysillum husk to the blend when baking? Nope! I don't find those necessary. Just stopping by to say that this recipe is great! I've been trying to create a good flour blend for my recipes and stumbled upon yours – I love it! I've already used it as a base in several new recipes with great success! i'm curious as you say "my hips will like it" – does that mean it has fewer calories than whole wheat flour? I would of thought it perhaps had more due to the nuts. it is one of the reasons I have shied away from GF blends so I would appreciate knowing if that was correct or not. Thanks so much. Hi Jacquie! I can't say exactly how the two would compare since I haven't calculated the nutrition information–you could plug it into a site like sparkrecipes.com to see the breakdown. My guess is that this blend is probably higher in calories than whole wheat flour (because almonds have so much fat–it's the healthy kind of fat, though), but is perhaps lower in carbohydrates. I usually try to include a moderate amount of healthy fat but limit my intake of simple carbs when I'm trying to lose weight, since that's what's worked for me in the past. Overall, though, this is definitely not a low-calorie food, so whether it's what you're looking for probably depends on your specific nutrition goals. Hope this info is helpful! This is awesome! My family and I are just starting Paleo and this recipe will be good to have for when I have an urge to bake something. Pinning! Thanks, Christina! Let me know how it goes if you try it.